FOXBOROUGH - Stephen Neal started his career as the longest of long shots and now he finds himself as one of the longest-tenured Patriots. 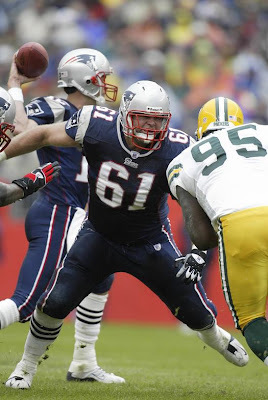 A two-time NCAA Division 1 wrestling champion at Cal State-Bakersfield, Neal didn't play a down of college football, and joined the Patriots as a project in 2001. The team cut him coming out of training camp that year and he was on the Eagles' practice squad before the Patriots plucked him back in December of that season. He has been a Patriot ever since. The 32-year-old right guard is one of just six remaining Patriots to have been with the team for all three Super Bowl titles. The others are Tom Brady, Matt Light, Kevin Faulk, Tedy Bruschi, and Richard Seymour. The self-effacing Neal was quick to point out that he was an inactive in 2001, the team's first Super Bowl title season, and on injured reserve following shoulder surgery in 2003, when it captured its second Lombardi Trophy, but he remains one of the great finds of the Bill Belichick era. Shoulder injuries cost Neal three games in 2006 and eight games in 2007. Then he suffered a knee injury in Super Bowl XLII that caused him to open the 2008 season on the reserve/physically unable to perform list. He sat out the first five games of last season. Neal's goal this season is to play in every game, something he hasn't done since 2005. He already has a leg up from last year in the offseason conditioning program, as instead of rehabbing the knee he's working out with his offensive linemates. "It's definitely a goal to try not to get injured, but you can't really control what happens," said Neal. "You just go out there and get your body in the best shape possible and improve from last year." The Patriots, who rushed for 2,278 yards last season, the sixth-highest total in team history, were a better team on the ground with Neal available. In the 11 games (nine starts) Neal played in last year, the Patriots averaged 156.4 yards per game on the ground. In the five he missed, they averaged 111.6 yards rushing. Maybe that's why the Patriots seem to be amenable to carrying his scheduled $3.4 million cap charge for 2009, the final year of Neal's contract. Neal was not interested in looking at what his football future might hold, although he left the door open to the idea that this might be his final season if he continued to grapple with injuries. "I guess football is day to day as you know, and [I] just take everything one day at a time and try to improve every day in this offseason and then when the season comes just see how my body can hold up," said Neal, who is entering his eighth season. "[Then] at the end of this season see where I'm at then and decide if I'm going to keep going or what the options are. Everything is pretty much day to day." Neal's career has become something of an inspiration to other football players with wrestling backgrounds. Neal said his role model was former Steelers offensive lineman Carlton Haselrig, a six-time NCAA wrestling champion at the University of Pittsburgh-Johnstown who never played college football but earned a Pro Bowl berth in 1992. Neal said anyone looking to him as inspiration is allowing him to carry on Haselrig's legacy, which Neal said was "a pretty cool thing."